Littelfuse’s LSP05G thermally protected Surge Protective Device is a self-protected device specially designed to be used in outdoor and commercial LED lighting fixtures for transient overvoltage protection. It has been developed with Littelfuse’s thermally protected varistor technology. Its built-in thermal disconnect function provides additional protection to prevent catastrophic failure and fire hazard even under extreme circumstances of varistor end-of-life or sustaining over voltage conditions. It also provides high line-to-earth/ground resistance, facilitating faster production line testing. 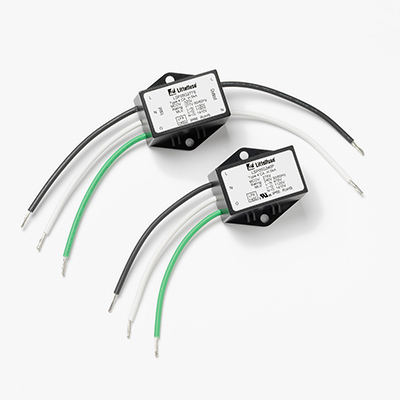 LSP05G series connected option allows clear indication of thermal fault protection by disconnecting power to luminaire, thereby signaling SPD module replacement. The LSP05G Surge Protective Device facilitates customer’s product compliance to IEEE C62.41.2 Location Category C Low and US Dept. of Energy MSSLC Model Spec.